2 months ago local store Carrefour has a strawberry sale - $2.35 a punel. I picked up 6 boxes contemplating to make strawberry sorbet. My good old raspberry puree has been sitting in the freezer for months. My wife has been nudging me ever so gently that it's occupying valuable District 10 space (in Singapore). Its polite way of saying - please get rid of it ASAP! 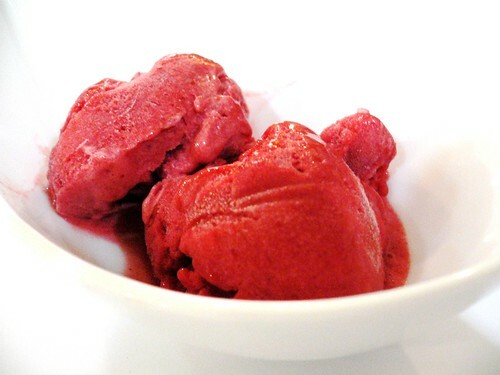 So I combine the left over raspberry and fresh strawberry to make sorbet. Let me tell you making strawberry puree is hard work. It's good for me especially for an old chubby flabby man like me. You need to sieve out the strawberry seeds, using a spatula and a fine mesh sieve. 1. Wash and soak strawberry for 10 minutes to remove the grime and yucky stuff. 3. Hull the strawberry. 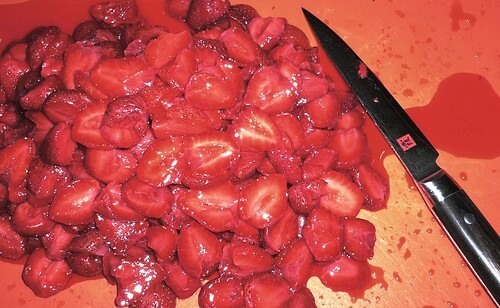 More instructions of how to hull strawberry and be found in http://baking.about.com/od/piesandfruiteddesserts/ss/strawhearts_3.htm. Be careful you can lose a finger or two doing this. 4. Slice the strawberry shown below. 5. Pour the wine, strawberry and all the sugar in a sauce port. Mix them up and heat using moderate heat. Let it boil for 5 minutes. 6. Take out the soften strawberry using the sieve. Do not discard the remaining wine you will need it later. 7. Puree the strawberry using you favorite blender. If you do not have a blender you can use mortar and pestle to ground the strawberry. 8. 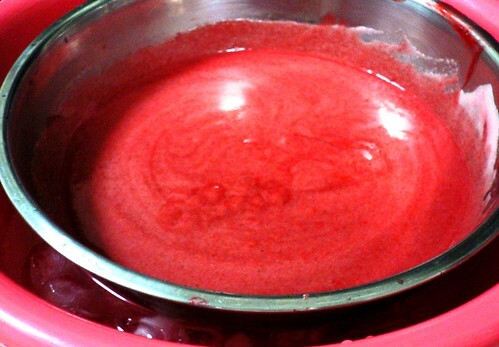 Pour the strawberry puree through a fine mesh sieve into a large enough bowl. Now use a spatula or a spoon and press the puree through the sieve. You will be surprised at the amount of tiny strawberry seeds. Imagine this will get stuck between the recesses of your teeth and it irritates you till no end while you are eating and slurping down the sorbet. 9. Add the raspberry puree into the strawberry puree and mix them again. 10. Sit the bowl into a large larger containing ice and water. 11. Wash the fine mesh sieve and put it on the bowl of strawberry and raspberry puree. 12. Now we are going to temper the egg whites. Bring the above step 6 wine to boil and remove from heat source. 13. Put the egg white in a large container and whisk the egg white for about 10 seconds. 14. Slowly pour the hot steam wine in a steady stream into the egg white using a ladle. Using the other free hand, continue to mix the egg white while you are pouring the water. A lot of hand coordination here. 15. Now pour you hot syrupy wine and egg white mixture back into the sauce pot, and heat the mixture moderately, stirring the mixture slowly and constantly. We are thickening (tempering) the mixture, into a custard like consistency. You heat until to about 75C - 79C using a thermometer to measure the temperature. If you do not have thermometer you observe the custard coats the back of the spoon or spatula you are using, it's ready. 16. Immediately pour this custard through the sieve and into the cooled strawberry raspberry puree. This would stop the custard from cooking immediately. 17. The consistency of the combined custard should look like this. 18. Store the custard in the refrigerator overnight or at least 8 hours. 19. Churn the custard according to your ice cream maker. p.s: I hate sieving too but ...c'est la vie! this looks soothing but the process takes a long time. Stef, same here, i hate sieving. sieving ..yes, alot of hard work. Wait till you try making wine at home. That's a lot of sieving and sieving.. I am a fan of Thomas Keller. One of the basic techniques he mentioned is sieving. The 3 Michelin Star chef is a fanatic when it comes to sieving for the clean, clear and crisp taste in cooking. In his books he mentioned he sieves about 20 times for his soups, broth and sauce !